LIBERAL, Kan. – The battle for first place in the Jayhawk West turned into a blowout as the No. 8 Lady Saints cruised past the No. 20 Colby Trojans in straight sets, 25-16, 25-19, 25-17. With the win, Seward now owns sole possession of the Jayhawk West with a perfect 6-0 conference record. Looking to win their 16th straight match and 4th straight against a ranked opponent, Seward County wasted no time to get on top, jumping out to a quick 7-2 lead following three straight Luz Sierra points. Still leading by five late in the set, Giovanna Tapigliani sparked a 4-0 run to push the score to 20-12. The lead would increase to one more point as the Lady Saints ran away with a set one win, 25-16. 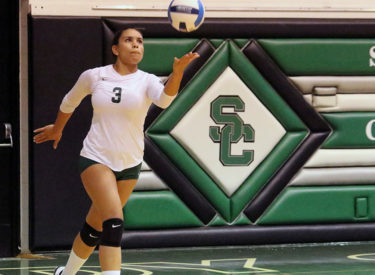 The Lady Saints were extremely efficient in set one, with over 61 percent of their attacks landing, while coming away with 20 kills in the set. The second set would be the closest of the night as the efficiency took a dip for the Lady Saints, coming away with just 11 kills on 30 attempts. The set appeared to be going in the same direction as the first, as the Lady Saints held an eight-point lead late, with a 20-12 advantage. A Trojan timeout sparked a 6-0 run to cut the lead to four. Following a Seward timeout to re-focus the team, the Lady Saints took set two by a score of 25-19. Sierra and Tapigliani continued their dominant display in the third set, coming away with seven of the first ten Seward points to give the Lady Saints a 10-4 lead. The Trojans cut the lead to two and with the Lady Saints leading 13-11, a questionable replay stopped the Colby momentum in what would have made it a one-point game. After the replay, the Lady Saints went on to win 10 of the next 13 points to take a sizable lead, eventually winning the set 25-17 and sweeping the 20th ranked Trojans. Tapigliani (16 kills) and Sierra (12) kills lead the Lady Saints on offense, while Djuly Schmorantz (11 kills) joined them with double-digit kills. Tapigliani and Schmorantz both completed a double-double, coming away with 10 digs and 14 digs, respectively. Pacing the offense, once again, was freshman setter Laura De Pra, who came away with 38 assists. De Pra put the Lady Saints in place to hit a combined .484 on the match. On the defensive side, Sierra continued her hot streak at the net, coming away with six blocks. This marks her third straight match with at least four blocks. Nathiellen Machado came away with her third 20 dig performance of the season, finishing the night with 22 digs. Seward will travel to El Dorado on Wednesday (September 26) for a 6:30 p.m. match against Butler. Following the match against Butler the Lady Saints will travel to Tyler, Texas for the TJC Invitational where they will play No. 6 Navarro and North Central Texas on Friday before finishing the invite with matches against Blinn and No. 9 Tyler on Saturday.